Choose an Industry or Application to find an imagePROGRAF that fits your needs. To view the imagePROGRAF TX-3000 model, click here. The T36 scanner incorporates a SingleSensor Technology Assembly3, which helps provide consistent and better colour accuracy with more detail in the shadows and highlights than a staggered CIS array scanner. The new TX Stacker can stack up to 100 sheets of ARCH C, ARCH D, or ARCH E/E1 page sizes for increased productivity. SmartWorks MFP software gives you the tools you need to quickly and easily scan to print/file/share large format technical documents. With a simple to use interface and scan-it-once ability, this software allows for efficient batch scanning and helps create quality scanned images that can be produced in a short amount of time. You can scan to PDF, TIFF and JPEG file formats. SmartWorks MFP software is more efficient than ever before. The large, colour 15.6-inch flat panel HD touch screen makes it easy for users to preview and edit scanned images. The easy-to-use touch screen equipped with ten finger multi-touch technology makes one-button scanning/copying easier than ever, and the built-in USB ports allow users to load files to the hard drive of the PC for simple file management. Print Plug-in for Microsoft Office - easily print large-format documents created in Microsoft® Word®, Excel®, or PowerPoint. Quick Utility Toolbox - Portal to where all of the Canon printer software and tools can be accessed. Device Management Console - Monitor the status of up to 50 TX Series printers! Media Configuration Tool - Manage, update and arrange media information in the operation panel and printer driver. Cut Sheet - 8"- 36"
Canon genuine inks are developed to optimize the performance of the imagePROGRAF lineup. Expertly engineered, they provide top performance, reliability, and optimum output. Lucia EX and Lucia pigment inks were designed to produce images with accurate colour reproduction, smooth gradations, and sharp details. Reactive inks have been formulated to print highly accurate and detailed AEC/CAD/GIS documents, enabling colour output with clear fine lines and details, and increased print durability. 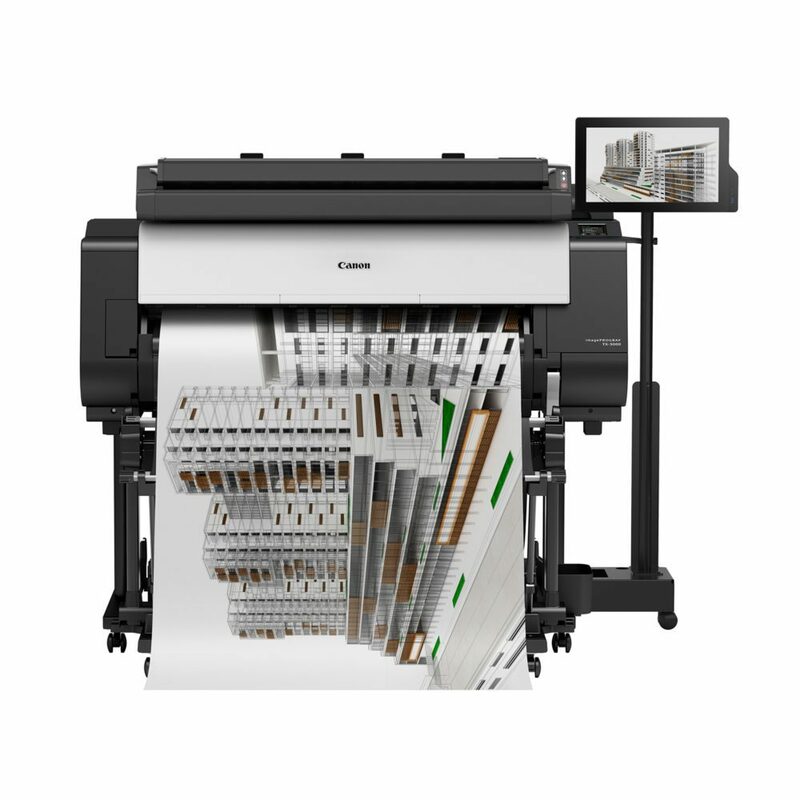 Canon media is designed to showcase the precision, quality, and consistency of the imagePROGRAF large format printer lineup. Whether it’s high-quality gallery-ready artwork or everyday printing, Canon offers over 50 types of media to choose from to fit your quality, productivity, and budget requirements. Find and download the latest drivers and software for your imagePROGRAF large format printer. 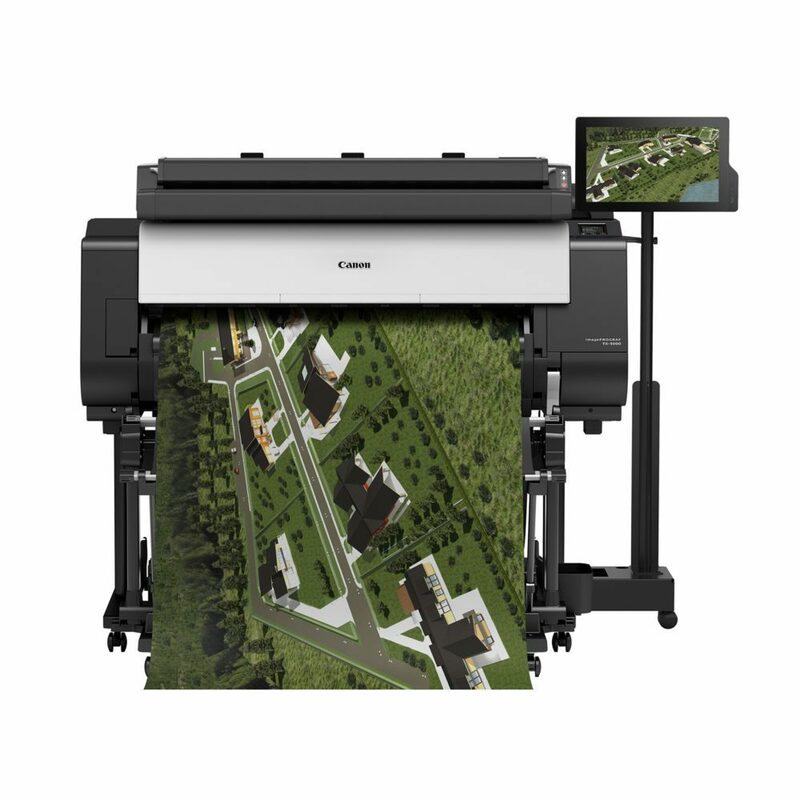 Have a question about an imagePROGRAF large format printer? Quick and accurate answers are here at your fingertips. Our team of service and support professionals helps you get the most out of your Canon products by offering support whenever you need it. 1. Estimated to be available Q4 2018. 2. Your server must be compatible with a webDAV enabled cloud account, including but not limited to, Google, Carbonite or Rackspace, to take advantage of the cloud functionality. Storage capacity and any pricing thereof is based on the third-party cloud provider’s current offering, at its sole discretion. Your cloud account is subject to the third-party cloud provider’s terms and conditions. 3. SingleSensor Technology Assembly means that multiple sensors are contained in one assembly device. 4. The 700ml ink tank is only available for service authorized partners. 5. Plain Paper, Fast (Q5) mode. 6. Canon products offer certain security features, yet many variables can impact the security of your devices and data. Canon does not warrant that use of its features will prevent security issues. Nothing herein should be construed as legal or regulatory advice concerning applicable laws; customers must have their own qualified counsel determine the feasibility of a solution as it relates to regulatory and statutory compliance. Some security features may impact functionality/performance; you may want to test these settings in your environment. 7. Wireless printing requires a working network with wireless 802.11b/g or 802.11n capability. Wireless performance may vary based on terrain and distance between the printer and wireless network clients. 8. For imagePROGRAF Printer Driver. For printing from PostScript applications such as Adobe Illustrator or QuarkXpress, please use a PostScript compatible RIP package. 9. Support estimated to be Q4 2018 by updating firmware. AirPrint functionality requires an iPad, iPhone 3GS or later, or iPod touch 3rd generation or later device running iOS 4.2 or later, and an AirPrint-enabled printer connected to the same network as your iOS device. A printer connected to the USB port of your Mac, PC, AirPort Base station, or Time Capsule is not supported. The imagePROGRAF TX Series MFP T36 systems contain multiple components, some of which are manufactured by third parties. To the extent that such third party offerings come with limited warranties, such limited warranties are hereby passed to the purchaser, and Canon shall have no obligation or any liability with respect to such third party offerings. Canon, CanoScan and imagePROGRAF are registered trademarks of Canon Inc. in Canada and may also be registered trademarks or trademarks in other countries. Wi-Fi is a registered trademark of the Wi-Fi Alliance. Android is a trademark of Google Inc. Apple, AirPrint, iPad, iPhone, iPod touch, Mac and Time Capsule are trademarks of Apple Inc., registered in Canada and other countries. Microsoft, Office, Windows, Outlook, Word, Excel and PowerPoint are either registered trademarks or trademarks of Microsoft Corporation in Canada and/or other countries. Autodesk, the Autodesk logo and AutoCAD are registered trademarks or trademarks of Autodesk, Inc., and/or its subsidiaries and/or affiliates in Canada and/or other countries. All referenced product names and trademarks are the property of their respective owners. Specifications and availability dates are subject to change without notice. Not responsible for typographical errors. Neither Canon Inc. nor Canon Canada, Inc. represents or warrants any third party product, service or feature referenced hereunder. Canon is a registered trademark of Canon Inc. All other referenced product names and marks are trademarks of their respective owners.. All images and footage on this site are the legal property of Canon Canada Inc. (CCI) and may not be copied or used without CCI consent. Prices, availability and specifications are subject to change without notice. While CCI uses reasonable efforts to include complete and up-to-date information, CCI cannot guarantee the accuracy of all the information. Accordingly, CCI assumes no responsibility and may choose not to honour any errors or omissions relating to the sale price of items shown. CCI assumes no responsibility for any errors or omissions in the content of this website.